Watchmen is soon to open in UK cinemas and there is various viral activity in support of the Watchmen opening - even a viral hub that offers all the viral assets and easy embedding. The Dark Knight set the bar for viral pre-release activity and I'm not sure anyone will ever equal it. 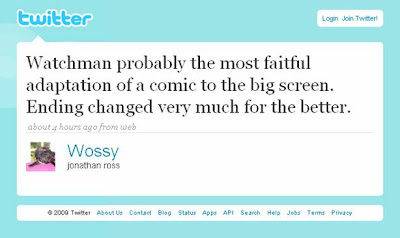 However, the social landscape is changing quickly and Wossy's pro-Watchmen Twittering (to a huge following) is a good example of how social media activity can amplify an event. Film premieres have traditionally been about red carpets and glamour pap pictures for the following days' papers - as we go forward could Twitterers and live bloggers become more useful (to movie marketers) than glamour models and C-list celebs? !